This is my second post of the day...so please click here to see my lovely Vintage Rose Pin Tutorial that I created. It is week 59 at Sugar Creek Hollow, and our theme this week is Numbers and Letters. We would like to see you use both letters and numbers in your Vintage or Shabby Chic creations. I used all kinds of words (on the images and a stamp), and then I used a date stamp for the numbers. I made the charms for a swap that I am participating in over in the Black Cat Forum! I am so excited because I will be swapping charms with some of my favorite Black Cat Cougar Peeps!! Lisa (she set up the swap), Penny, Elizabeth, Retta, and some other new peeps. I can't wait to see what everyone creates!! For my charms I used some images from Gecko Galz. Inked the edges with Ranger's Vintage Photo. Each charm image measures One inch long. I used Art Glitter Just Peachy around the edges of the charm above. I also covered it with Utee. This one I covered with Utee as well. wrapped between two holes I punched with my crop o dile to hold up my charms. I altered all the images in GIMP, and I used a piece of Core'dinations kraft cardstock, and an edge embossing folder. I sanded and inked with Ranger Vintage Photo. I can't wait to see your Words and Number creations!! Hello Peeps!! Happy Saturday!! Today I would like to share with you a sweet little Vintage creation. This little sweetie can be a pin, magnet, necklace charm or embellishment for a scrapbook page or card! I have decided I will be adding a pin back, and creating a pin. Here is what you will need. Art Glitters # 295 ensalada, #142 coral reef, #267 cheeky pink and 193 Martha's yard. scrap piece of thin cardboard (cereal box etc). glass sead beads, metal charms, pin heads and o-rings. First you will want to cut yourself three 2" inch pieces of champagne netting. I used the art glitter glue to glue the three layers together. You will want to measure your scrap light card board piece to be about 1/4" smaller than your champagne netting. Using a brush apply the designer glue to your piece of cardboard. Then center it on your Champagne netting. I flipped my piece over and using the fine tip applicator applied the designer glue to the edge of my crochet lace, and glued it around the edges of my piece of champagne netting. Then I grabbed some of the baubles and buttons from the latte collection. I used some eye pin heads and used them with the two round bead like buttons. I strung a few beads and charms on some other eye pin heads. I used the rounded end jewelry tool to close the other end. I used jump rings and attached them by placing them through the holes in the lace (that is why I chose this lace). I applied the moss leaves to the left and topped off with one of the latte buttons. In the lower right I added another latte button, that I tied with the brown sugar bakers twine to create a cute little bow. I cut out the collage pieces, and inked the edges with Ranger's Vintage Photo. I used the fine tip applicator and outlined the inner part of the rose and applied the coral reef glitter, then applied glue to the outer petals and used cheeky pink, then outlined the leaves and applied ensalada glitter. I outlined the text box with glue and added Martha's yard glitter, and then covered the piece with UTEE. Then I glued the pieces in place on my champagne netting. Once you are all finished, then you can glue on your pin back, magnet or loop. I hope that you enjoyed my post today!! It is week 58 at Sugar Creek Hollow, and our theme this week is Baby Face: Vintage Baby Cretions. We would like to see you use babies in your Vintage or Shabby Chic creations. I started out with a baby image from Gecko Galz. Inked the edges with Ranger's Vintage Photo. Below you will see that I added some baby blue flatback pearls, pink leaves, crochet lace and raspberry baker's twine from Really Reasonable Ribbon. I used a Pink rosette, and some light celery crochet lace from Really Reasonable Ribbon to create a flower in the upper right of the card. Before I forget, we have a Design Team Call going on and you have till April 21st to apply. Also one of my favorite online Peeps Starr is our Guest Designer this week! So please stop by her blog and leave her some love!! I can't wait to see your baby creations!! It is cloudy and rainy here again in Michigan...booo hooo!! I can't wait for Spring to actually get here. I have spent a little time cleaning leaves out of my garden, but I have not really got to play yet! I am so super happy for her!! Sugar Creek Hollow Design Team!! The last day is April 21st!! 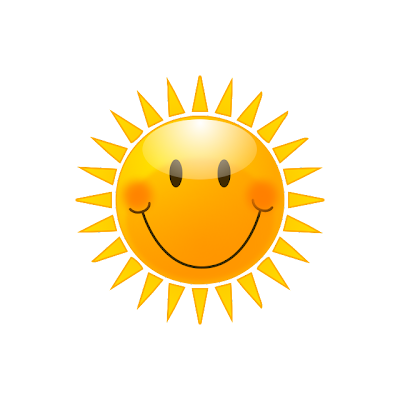 So I hope you all have a bit of Sunshine in your day!! I thought I would make a Birthday card for a friend. I used the collage sheet that I designed below. You can purchase the collage sheet here. So you can hop on over to the RRR blog and see the rest of my card. I have some super exciting news to share with you today!! I am being featured in the Papers and Pixels magazine this month. I have joined the Art Glitter Design Team! Mother's Day and Ribbon Challenge over at Really Reasonable Ribbon!! I used the Brown Sugar Baker's Twine, Jumbo and regular size moss green leaves, newsprint candies, latte buttons, melon hand dyed silk, diamond satin olde gold ribbon, crochet lace and moss green jute twine from Really Reasonable Ribbon. I also used the scor tape to adhere my diamond ribbon, and candi fix it foam pads to elevate my newsprint candies. I used my favorite Art Glitter Designer Glue (Dries Clear)..it works great with the #162 Just peachy transparent glitter that I applied to the rose center piece edges and butterfly wings. There is a Art Glitter Designer Glue that dries white...but I wanted to see through the glue. Next I used the Art Glitter Glue and Fine tip applicator..(.honestly...this glue and applicator are my FAVORITE. I have loved them for a LONG time), to go outline the edge of my tag and Mother text box and applied the #300 Camel glitter.l I love it!! I just love how my little tag turned out!! (the rose on my circle is one of Karen's images). Today we have some exciting news at Sugar Creek Hollow!! Sugar Creek Hollow is holding a Design Team call. We are looking for three (3) individuals to join the Sugar Creek Hollow Design Team. The successful applicant does not have to have Design Team experience but must have an active blog and be creative, enthusiastic and punctual. We will be moving to challenges every two weeks beginning in May. Week #12 Pearls and Swirls.on May 19th 2012. I can remember it, because that was back when I first decided to actually try out for a Design Team. I had decided (last minute of course because that is how I create....last minute) to try out for the Shabby Tea Room challenge blog. Of course I never said anything, but obviously I didn't make the Design team. Let's just say I was a little bummed out about it, because I thought I would fit in well there. At that time I had no idea...that there was actually another weekly Challenge Blog that I actually fit into better! That was Sugar Creek Hollow (vintage style...and I may be shabby at times...but more so vintage). I would not of found SCH if it had not been for the Shabby Tea Room call. I visited Debbie's blog,( she runs the tea room challenge and she gave me some tips on how to take better photos)..and noticed she had entered a challenge at SCH.....that is when I knew...that was the place for me. So...what is the moral of my little story? Go ahead and try out for Design Teams....maybe you won't make the team, but you should NEVER think that you are not good enough...it may just be that your style is not what they are looking for...and there is somewhere you fit better just waiting for you!! Took me a while to figure this out.....LOL...but really it is true. I am hoping to take on a new role at SCH....in that I hope to sponsor some of the challenges. 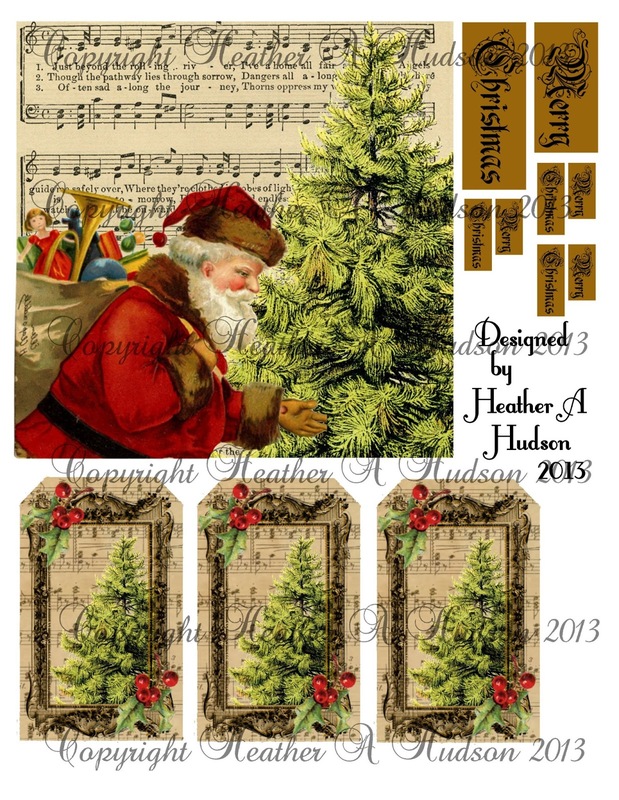 I am sooo excited about creating more digital collage sheets and offering them as prizes!! So I really hope that if you have been playing along at SCH...that you will apply!! You will LOVE it there...Cec and the rest of the galz are all really fun to work with!! This Design Team call will end on April 21st and successful applicants only will be notified by April 25th. It is week 57 at Sugar Creek Hollow, and our theme this week is Stamping: Rubber or Clear...sorry no digital stamps. We would like to see you use stamping in your Vintage or Shabby Chic creations. I decided to create a tag. I started out with a base tag that I got off the collage sheet I designed for Gecko Galz. I used my favorite background stamp and Rose stamp that I hand carved with Stazon Jet black ink. The little text boxes are from a collage sheet I designed. I used the crochet lace, moss green leaves, latte button, and Brown Sugar baker's twine, pink swirls ribbon and candi from Really Reasonable Ribbon. #243 Gingerbread glitter and Art Glitter Designer glue (dries clear) on the edges of my card after inking with Ranger's Vintage Photo. What a LOVELY assortment for Spring projects!! I love all of the blue, green and white colors in this month's kit. I spent some quality time with my BFF Ginny at her Scrapbook Store the other day and she came up with this fabby idea...that we would both make clipboards. She gave me a fabby clipboard and we shared some fabby papers and stickers from her shop. Here is my Clipboard below. There are three tags that peek out from the right, and four little tags on the front. I inked all the edges with Ranger's Vintage Photo distress inks. I also used some scor tape, Art Glitter Designer glue, and candi fix it foam pads from Really Reasonable Ribbon. Here is a close up below of some of the other fabby trims and ribbons that I used from Really Reasonable Ribbon. I used a fabby amount of red, parrot and white leaves. The Latte buttons, newsprint candies, lemon, teal and peppermint baker's twine. I also used the white lace, green satin ribbon, turquoise diamond satin and the cute satin bows were made by my BFF Ginny from the kit as well. She decided to go with the green bows...so I took the blue ones. Here are some photos from other angles...look at the pretty bows! Here is a look at the clipboard without the tags. This is the challenge she started in March (you have till the 12th of April). I was so busy the past few weeks, that I am just now finally getting around to creating my Christmas Bags. Please visit Sandi's blog to read all about the challenge. Here is my first bag. I started out with a plain white bag that my Mother used for Easter Baskets this year. Kids are all teenagers, so she just filled up these white bags with some yummy goodies. As soon as I saw the bags...I knew I would use them for Sandi's Challenge. I created the collage sheet below. 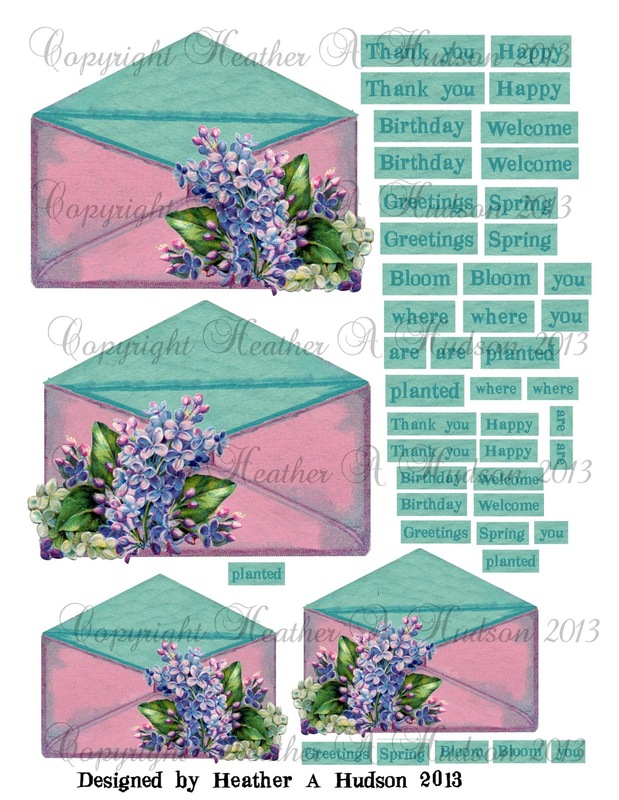 There is an image for a gift bag, and three tags, as well as the text boxes. You can purchase it in my Etsy shop here. I inked the edges of my bag, collage pieces and piece of Core'dinations Kraft Core red cardstock. I cut the cardstock to measure 7.5" by 9.5"
I used a scoring tool to emboss a line around the cardstock 1" in to create a frame. I then used a paint brush handle to do some free hand embossing of holly leaves and flourishes. Once this was finished, I sanded the embossing so the kraft core would show. You can see some of this below. I used ivory crochet lace, newsprint candies, brown sugar baker's twine, buttons and jumbo May Arts moss leaves all from Really Reasonable Ribbon. Speaking of Really Reasonable Ribbon, Bonnie is having a 3 day sale. It started on Monday...so please stop by RRR and check out the great deals Bonnie has for you. Here is a close up of the right side. I used the candi fix it foam pads to elevate my text boxes and newsprint candies. I hope that you have a chance to create some Christmas bags for Sandi's challenge!! If you do a little shopping at RRR, then I hope you get some fabby ribbons and trims! !